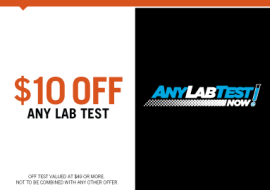 ANY LAB TEST NOW® offers fast, affordable, convenient, reliable lab testing. All of our tests are 100% confidential and only you see the results. No doctor referrals or insurance needed. No unwanted questions. Just the tests you need when you need it without delay. ANY LAB TEST NOW® is revolutionizing the health care industry by offering direct-to-consumer laboratory testing services that provide a convenient, confidential, reliable and affordable way for consumers to take control of their health care costs and provide them complete access to their health information. is a healthcare lab testing facility that provides thousands of medical lab tests to consumers and employers in a professional, convenient and cost-effective way. guarantee you will be seen in 15 minutes or less with most results back in 24 to 48 hrs!!! delivers the same high quality tests as your doctor or hospital would order. it is our goal to make lab testing affordable for everyone. You DON’T need a prescription, just stop in at the lab for your test and your secure and confidential lab test results can be sent to you via an online look-up. staff is fully trained, experienced and certified and is always willing to answer all your questions and provide you with best service possible. Extremely fast meets extremely high accuracy. From our brand new facility, we’ve partnered with the largest CLIA-certified diagnostic laboratories in the country to bring you the highest-quality tests with the most accurate results – which you can usually receive within 48 hours. Now you can order affordable blood tests and receive your results confidentially, without visiting your doctor. We deliver the same high quality tests as your doctor would order. To make sure that our tests are of extreme high quality and deliver the most accurate results, we are affiliated with major fully accredited Medical Reference Lab in the U.S.
Come to our clean collection facility where our friendly and professional staff will help you with all your questions and provide you the best service possible. Our tests are extremely affordable with no hidden charges, taxes or draw fees for blood. You receive most results fast and within 24 hrs. You can decide how you want to receive them. We can either call you and you come to pick them up or we can email, mail or fax them to you. efficient way for any consumer or employer to go. And that’s right here. At ANY LAB TEST NOW®.